The McLane Large Volume Water Transfer System (WTS-LV) is used to collect a single sample onto a 142mm membrane filter by drawing ambient water through the filter holder without passing through the pump first. It is most commonly deployed suspended from the hydrowire of a research vessel. Depending on the filter installed it may be used to collect suspended particles, particulate trace metals, phytoplankton or micro-plastics. The WTS-LV is available with a choice of pump size to suit a range of filter porosity depending on the specimen to be collected. As material accumulates on the filter, the pump speed dynamic algorithm adjusts to minimise the risk of a damaged sample and maximise battery endurance. The filter holder is modular and designed to evenly distribute collected material. 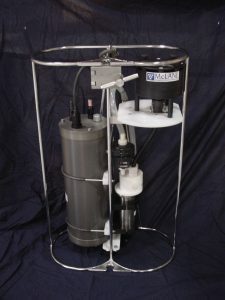 A three-tiered filter holder option is also available. WTS-LV-Dual Filter – two vertical intake 142 mm filter holders to allow simultaneous filtering using two different porosities.